Games Played. 22. Won 15. Lost 6. Drew 1. Goals Kicked. 122 for. 81 against. V.F.A. tried to stem the influence of professionalism. The Association introduced a 12 month disqualification against any player who accepted payment for his services directly or indirectly. The administrators saw payments as a "growing evil which was not in the best interest of our game." The Umpire shall bounce the ball instead of throwing in up in the air when teams changed ends. Goal Umpires were to wave two flags for a goal and one for a behind. Time Keepers introduced, one from each club, to ring the bell at the end of the match. V.F.A. would fine clubs if they were more than 10 minutes late in starting a game. Clubs to change ends every 30 minutes. Little marks now have to travel a minimum of 2 yards. New V.F.A. teams for 1886. Port Melbourne, South Williamstown, Footscray, and Prahran. St.Kilda returned from junior ranks. Carlton started the 1886 season with 4 wins and then a draw against 1885 Premiers South Melbourne. Billy Strickland was a star in each of these games. 15,000 plus crowd turned out see the Blues take on South Melbourne. Carlton 9.19 defeat St.Kilda 2.8. Best for the Blues were Sam Bloomfield , Mick Whelan , Walter 'Dolly' Batters and Leydin. As St.Kilda were fencing their ground Carlton donated their share of the takings to the Saints. 16,000 plus crowd for the return match Carlton-South Melbourne. This record was soon overtaken when 30,000 saw Geelong defeat South Melbourne on September 4th. at the Lakeside Oval. Marks in those days were chest marks or taken out in front of the body. Essendon's Charlie Pearson stunned the crowd at a game against Fitzroy by leaping over a pack to take a spectacular mark. The Umpire allowed the mark, and this unique feature became part of the Australian game. Games were about team strength moving the ball to one end. Geelong devised a game plan of teamwork where players did not always man up. This left players free to make stunning dashes down the ground and delivering the ball to free running forwards. The proof- Geelong were undefeated and kicked 208 goals in 1886. Carlton would have to catch up. 1886. Premiers. Geelong, 2. South Melbourne, 3. Carlton, 4. Port Melbourne. This ladder differs slightly to the end of season ladder published in The Argus. Some ladders include pre season matches against junior clubs, plus other games against country clubs. See The Argus 1886 Season Review link after the last match. Some details are missing, if anyone has them please contact Blueseum. Carlton AGM at the Orderly Room, Grattan Street. Club President Mr. R. Robertson presided. More than 600 people attended. The chairman said the club's record last season was a fairly good one, and, with a little luck in their favour, it would have been still better. Last season the First twenty played 23, Won 13, Lost 8, and Drawn 2. Goal kickers; Baker 20, Breen 20, Wilson 10, T. McInerney 4, Whelan 4, Carter 3, Bragge 2, Leydin 2, Alex Mair 2, Woods 2, Johnston, Joyce, O'Bern, Merriman, Reid, Rickards, Strickland. Second Twenty, Played 23 matches, Won 11, Lost 3, Drawn 4. Goal kickers; Woodburn 6, Dalgleish 6, Boyd 6, Beere 3, Carter 3, Cooley 2, Andrew Connaughton 2, O'Shannassy, Merriman, Nairn, Saunders, A. Main, Davie, Forman, Daly, Metherall. The report stated that here was £104, 9 shillings and 2d. ($208.91)to the credit of the club. The committee was anxious to recruit the second 20, in order that they may be able to draft young and rising players into the first 20 from the junior ranks. At the close of the season the playing members and past captains of the club were entertained by the committee at a dinner at Clement's Hotel. Services to the club by retiring president, Mr. R. Robertson, were gratefully acknowledged. Patrons: Cr. Pigdon, Mr E. Latham, Mr. J. Bell, Mr. J. Ballinger, and Mr. R. Robertson. Vice Presidents; T. Marshall, W. Cook, J. Gardiner, J. Turnbull, W. Ievers. Hon. Sec: Mr. W. C. Donaldson. Committee: Whelan, Melville, Leydin, McCutcean, Strickland, Henry, Johnston, McIntosh, Hemsworth. Illuminated addresses given to J. Baker and J. Woods for long service to the seniors. Gold lockets presented to A. Alex Mair and T. Launders for "excellence of play" in the Reserves. The senior players awarded the Mr. G. Ellis prize, a marble clock, to M. Whelan for "best play in the team". "Mr. T. S. Marshall, hon.secretary, submitted a number of conditions under which he proposed that clubs should in future be admitted to the association. 1. That the club derious of joining must have taken a prominent position among junior clubs for at least two seasons previously to that in which they apply to join. 2. That it must have had for these two seasons a members' list of eighty, with a subscription of 5s for each member. 3. That the entrance fee of £2 2s, in addition to the delegates' fee. 4. That all applications to join the association shall be in the hands of the secretary on or before March 1 of each year, together with a statement showing the number of members and the amount of subscription. 5. That the club must have a properly inclosed ground. 6. That not more than one senior club for each municipality or borough shall be admitted to the association. 1. Any player receiving payment for his services as such shall be disqualified for the remainder of the season. 2. Any club paying any player, either directly or indirectly, for his services as such shall be fined £10, and lose the match for the first offence, and lose the match and be disqualified for the remainder of the season for the second offence. Carlton played a practice match on Princes Oval. The Minister for Lands Mr. Dow visited Princes Park. He met with representatives of the Carlton Football and Cricket clubs. The clubs occupy two different parts of the Park and they were willing to give up their grounds if one large suitable site, which they could share, could be granted. Mr. Dow said he could see no objections to the proposal, and he would contact the City Council who are represented on the park trust. Carlton played Star of Carlton (23) at Princes Oval. An unusual occurrence happened in this match at the start of the second quarter when the Carlton captain called for a count. The umpire counted an extra 3 Star players on the ground and their only goal was forfeited. Quarters were introduced this season. A. Aitken, Bloomfield (Capt. ), Alf. Berry, Bushby, Batters, W. Crapp, Coffey, Freeth, Johnston, Longstaff, Martin McDonnell, McDonnell)), McDowall, McIntyre, McCracken, Marks, Newton, Smith, Strickland, Taylor, A. Wilson, Whelan. Carlton played Brunswick (23) at Princes Oval. The report says it this is the first time Brunswick had played together. The Brunswick backline played well holding the Blues out for a considerable time. Strickland played a brilliant game and was best on the ground. Bloomfield, returning to the club this year was as good as ever. Bloomfield, Berry, Bushby, Black, Batters, Crapp, Cook, Drew, Freeth, Glasscock, Launders, Marks, McDonald, McDowall, McCracken, McPhee, McIntyre, Newton, Smith, Strickland, Taylor, Woods, Wilson. Australian Rules. -"The great want of space to play football on in Sydney was never more exemplified than it was on Saturday. No less than five clubs turned out to practise for the intercolonial match with Victoria, and there was only one ground to play upon, that of the East Sydney Club. Between fifty or sixty were there, all anxious to distinguish themselves." The clubs mentioned were East Sydney, Sydney City, West Sydney and Waratah. "An instance of how football in Victoria is so popular, the honorary secretary of it's association said on Monday night that the net proceeds after paying all expenses of the principal clubs were: - South Melbourne F. C., £500; Essendon F. C., £450; Carlton F. C., £370; Fitzroy F. C., £320. The others were all under £300." At the England vs Scotland Rugby International on February 20 the attendance was over 6,000. Port Melbourne colours maroon and navy-blue, Hannaysee former Carlton and South Melbourne player will captain Port. Last season Williamstown had a disagreement with the cricket club and as a result the South Williamstown football club was born. Colours light blue and white which would clash with Hotham unless Hotham make the addition of their blue sash permanent. Footscray, colours red, white, and blue. Prahran colours, light and dark blue. St.Kilda has returned to it's old colours of red, and black. Carlton has many new names in the team, Busby and others are said to be first class players. Star of Carlton remains a good recruiting ground for the Blues. A new innovation this season will be the introduction of quarters. It was felt that the team kicking with the wind for a hour had too much of an advantage. The usual 10 minute break at half time will remain, and the breaks at the end of the first and third quarters will only be long enough to change ends. V.F.A. Meeting at Young and Jackson's Hotel. A Football Association had been formed in Western Australia and the V.F.A. had received a letter from the West requesting a copy of the rules. Marshall proposed an amendment to the rule which stops a player after taking a mark from having his kick when the bell sounds. The secretary moved in favor of allowing the player to have his kick, however, the Fitzroy delegate moved against the amendment and it was defeated. Marshall also proposed that the ball had to be kicked 5 yards before a mark could be paid. Some delegates said it would spoil the game while others thought it would be a good idea. In the end it was agreed that no mark could be paid unless there was clear space of at least 2 yards between the two players. Carlton played University at the University Ground. Wind blowing strongly to the eastern end all day. The new rule requiring clubs to change ends every 30 minutes proved worthwhile. The Blues kicked with the wind to the northern goal. University were only one goal down at three quarter time and had the wind in the final term, however Baker scored an early goal for the Blues. The students quickly replied, but no further goals were scored. Baker, Bloomfield, Batters, Berry, Black, Cook, Crapp, Freeth, Glasscock, Johnston, Leydin, Marks, McDonald, McDowall, McCracken, McPhee, Newton, Strickland, Woods, Wilson, Whelan. The quarter and three quarter scores were not published, the above scores are a guestimate from the game report. Goals; Strickland, A. Wilson, Baker. Players mentioned, (9) Bloomfield, Batters, A. Wilson, Whelan, Baker, Cook, Newton, McDowall, Strickland. 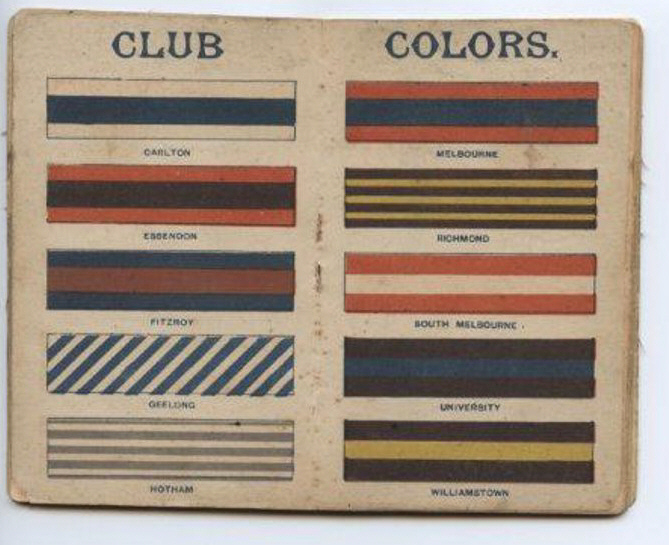 Carlton Seconds played Britannia at Princes Oval..
"The "fuchsias," as of yore, turned out in their well known blue and red uniforms, being captained by Morrison, whilst Walter Johnson led the Hothamites, who presented a remarkably smart appearance in their new blue and white vertically striped tunics." Carlton played Melbourne at the M. C. G.
There is a new optional rule for having boundary umpires, Melbourne wanted the Carlton players to agree, but Carlton could not "see it"
A warm north westerly wind blew across the ground. Bloomfield captained the team, lost the toss, and kicked against the wind. Due to the later arrival of Melbourne, the game started 20 minutes late. The Age report said of umpire Watsford, "he had to work hard as there were no boundary umpires to through the ball in." "Strickland got a mark at a sharp angle, about thirty-five yards from goal, however, by a beautiful drop kick, he put the ball clean between the posts, and scored first goal for Carlton within five minutes of the start." "Batters, one of Carlton's new men, who hails from one of the southern junior clubs, is about unselfish player as one would wish to see. He was instrumental in securing each of the six goals kicked by the Carlton against Melbourne on Saturday, and when on two occasions he had a reasonable show of kicking goals himself, he contented himself with passing the ball on instead of risking the goal. Batters is a grand all round player, and the Carlton have a splendid man in him. Glasscock is another good addition to the Carlton ranks. He formerly played with a club at Northcote, but has not been in harness for the last two or three years. His specialty is kicking. Newton, a strongly-built player from Brunswick, also adds status to the Carlton Club. Baker, Bloomfield (Capt. ), Berry, Batters, Bragge, Crapp, Cook, Coffey, Drew, Glasscock, Johnston, Leydin, McInerney, McDonald, McCracken, Newton, Strickland, Woods, Wilson, Whelan, McDowall, Freeth, Aitken. Goals; Baker 2, A. Wilson 2, Strickland, Berry. Best; Strickland, Bloomfield, Baker, Glasscock, Whelan, Drew. Players mentioned,(19) Bloomfield, Strickland, Baker, Whelan, McDowall, Batters, Glasscock, Newton, McCracken, Drew, Woods, Berry, Crapp, Cook, Bragge, Leydin, A. Wilson, McInerney, Johnston. Carlton Reserves played Melbourne on the Friendly Society's Football Ground. Carlton Reserves lost; 2 goals - Melb. 3 goals. The VFA donated £151 1s ($302.10) to various charites. The report said this amount would have been much greater had the Melbourne, East Melbourne, and the South Melbourne Cricket Clubs had sent their donations. Carlton played Richmond at the Richmond Cricket Ground. Bloomfield won the toss and Carlton kicked with the breeze to the railway end. The game got underway at 3.15pm. The Blues inaccurate kicking robbed them of a larger winning margin. Baker, Bloomfield, Batters, Berry, Crapp, Cook, Drew, Freeth, Glasscock, Johnston, Leydin, Marks, McDonald, McCracken, McInerney, Newton, Strickland, Woods, Wilson, Whelan. Goals; M. McDonald, J. Baker, T. Strickland, W. Glasscock, T. Leydin. Players mentioned; (12) Baker, Bloomfield, Leydin, McDonald, Whelan, W. Glasscock, Strickland, Woods, Newton, McCracken, McInerney, Drew, Wilson. Carlton Reserves played Richmond at Princes Oval. Adams, Beere, Beveridge, Peter Burns, T. Burns, Carter, Deely, Dalgleish, J. Dunn, Davie, Gregory, Hadley, Jackson, Lemon, Love, Merriman, McLeod, McDowall, Miller, O'Shannesy, Slattery, Smith, Woodburn. Victoria played New South Wales at the M.C.G. VIC. Captain; S. Bloomfield. Colours, Red, White, Blue. NSW Captain; former Carlton Captain, W. Goer. NSW Colours; Red, Black, Yellow. The visitors are from the Sydney, East Sydney, Waratah, City, Silverton, Albury, Wallsend, Northumberland, Newcastle City, and the Lambton clubs. Carlton players; J. Baker, S. Bloomfield, T. Leydin, W. Strickland, M. Whelan, A. Wilson. Apart from W. Goer, former Blues G. O'Neill and F. Bismire played for NSW. Goals; Houston 2, Tankard 2, Purdie, Roy, Whelan, Strickland. Best VIC; Bloomfield, Leydin, Powell, Wookey, Strickland, Roy, Todd, Houston. Best NSW; W. Goer, Butler, Brewer, Tubb, Bowen, Crisp, Oswald, Rounsevelle, Duguid. May 24 Monday Queen's Birthday Holiday. Carlton played Ballarat at Saxon Paddock (now City Oval), Ballarat. The team met at Spencer Street Station at 6.30 pm Saturday. Christie, one of the Ballarat players had his collar bone broken and was taken to hospital. Baker, Bloomfield (Capt), Bragge, Berry, Batters, Crapp, Coffey, Cook, Drew, Freeth, Glasscock, Johnston, Leydin, Marks, McDowall, McInerney, McDonald, McCracken, Newton, Strickland, Whelan, Wilson, Woods. Goals; Wilson 2, Berry, McDonnell/McDonald, Bloomfield, Batters. Carlton Reserves played Maryborough at Princes Park Maryborough. The team met at Spencer Street Station at 3pm Saturday. Carlton Reserves lost; 2 - 5. The Kyneton Observer (May 27 p2) reports that Carlton played Woodend on the Queen's Birthday Holiday. Carlton won. The Observer said it was from 'From Our Own Correspondent' May 25. Is it the Second Twenty who were in Maryborough, but they lost, or the senior team who were in Ballarat? Or perhaps it was one of the many other Carlton junior clubs? Carlton Football Club entertained the NSW Intercolonial Team at a banquet at Clement's Cafe. A. T. Gillespie presided and 110 guests were present. Former Carlton president Mr. Robertson was presented with a testamonial of a silver service and large cabinet photographs of 45 old members and players of the club. Mr. Robertson has resigned after of long term in office. Carlton played South Melbourne at the M.C.G. A beautiful day for football. Bloomfield won the toss & the Blues kicked towards the railway end, there was no wind advantage. Ground slippery from the Vic. - N.S.W. game the previous week. An exceptionally fast and even match. South's poor kicking in the final term cost them the game. Whelan had a free kick close to goal when the quarter time bell rang and because of the VFA rule at the time, he was unable to to take his kick. At the commencent of the second term Glasscock just missed a long shot and scored the Blues third behind. "Of course the spectators were kept on the pinnacle of excitement throughout the continuation of such a well contested match, and the applause continually surged up from the assembled thousands like a continuous roar of waves breaking on a shingle beach." It was said that the crowd's roar could be heard from Swanston Street. Blues had the better of the match for most of the day but they tired in the last quarter. With five minutes to and the scores level and with the ball rolling through for a goal to the Blues, a Carlton player tried help it on its way and put his foot to it only to see the ball veer off his boot through for a behind! Baker, Bloomfield, Batters, Berry, Bragge, Breen, Crapp, Cook, Coffey, Drew, Glasscock, Leydin, McInerney, McCracken, Martin McDonnell, Newton, Strickland, Woods, A. Wilson, Whelan, Freeth, McDowall, Marks. Quarter and three quarter times scores were not published. The above scores are guestimates from the match report. Best; Strickland, Berry, Whelan, Bloomfield, Bragge, McCracken, Cook. Players mentioned; (18) Bloomfield, Whelan, Breen, Leydin, Strickland, Cook, A. Wilson, Glasscock, Berry, Woods, Newton, Baker, Martin McDonnell, Batters, Crapp, Bragge, McCracken, Drew. Carlton Second Twenty played South Melbourne on the South Melbourne Football Ground. The team met at Rickards at 2.30pm. The Blues scored their only goal in the first quarter. Carter hurt his thigh in a clash. Adams, Burns, Burns, Beere, Beveridge, Carter, Cader/Calder, Deely, Davie, Dalgleish, Gregory, Hadley, Jackson, J. Dunn, Lemon, Love, McLeod, Martin McDonnell, Martin, Merriman, O'Shannesy, Smith, Slattery, Woodburn. Carlton player, John Rickards aged 26 died at home at 245 Lygon Streeet. Brother of James, Joe, and T. Rickards. Carlton played Fitzroy on the Fitzroy Cricket Ground. The grandstand flag flew at half mast as a sign of respect to the death of Carlton player John Rickards on Wednesday last, he was aged 26 years. The Carlton players wore crepe on their arms as a mark of respect. According to the web site www.fitzroyfc.com.au, in this match, J. J. Trait was the first umpire to use a whistle. Bloomfield lost the toss and the Blues kicked to the Brunswick Street goal. A fast and rough game throughout. Second Twenty player Alexander Beveridge was one of the Blues' better players. Fitzroy's accurate kicking was the difference. J. Baker, Bloomfield (Capt. ), Batters, G. Bragge, Beveridge, Crapp, Cook, Coffey, Glasscock, Johnston, Leydin, Marks, Martin McDonnell, McCracken, McInerney, McDowall, Newton, Strickland, Woods, Wilson, Whelan. Carlton Reserves played Fitzroy at Princes Oval. Adams, Beere, Peter Burns, Peter Burns, Cader/Calder, Carter, Coles, Deely, Davie, Dunn, Dalgleish, Gregory, Hadley, Jackson, Lemon, Love, Martin, Merriman, McLeod, Martin McDonnell, O'Shannesy, Smith, Slattery, Woodburn. "A level 100 was laid last evening that the South Melbourne footballers would beat the Essendon team on Saturday, and subsequently 50 to 40 on the latter, and 100 to 90 was laid on Geelong against Carlton." "Directing attention to the necessity of central umpires being firm in their ruling, and stating that owing to the vacillating conduct of that officer at the late match between their club and Fitzroy they had lost by one goal. A lengthy discussion ensued, and it was eventually decided to refer the matter to the permanent committee." "that one flag be held up on a behind being gained, and two flags for a goal, as is the practice in Tasmania." This was also referred to the permanent committee. The advisabilty of the central umpire blowing a whistle instead of holding up his hands when play is to be stopped was also referred to the permanent committee. The rule regarding what distance between players constituted at mark was reduced from 5 yards to 2 yards. "In the match between Carlton and Fitzroy (Victoria) clubs on Saturday, whistle was used for the first time to call the players back when the ball got out of play. The game was witnessed by about 12,000, and owing to the continuous shouting and cheering of the crowd even the shrill notes of the whistle were at times unheard. There can be no doubt however that its general use will prevent much of the useless play which now takes place after the ball goes out. On our own comparatively quite grounds the use of the whistle would at once stop the play, and it is a pity it is not tried." South Adelaide, the South Australian reigning premiers, are in Melbourne to play a series of matches with senior clubs. The Australasian in it's report mentions that South Adelaide was founded by two former Carlton players Sam A. Wallace and George D. Kennedy. South Adelaide played it's first game in June 1876. Carlton played Geelong at the M.C.G. Melbourne Punch June 24 (p2) reporting on this match said umpire J. Shaw "introduced a new feature in the shape of a whistle to announce out of bounds." The Blues lost the toss, and play began at 3.15pm with Carlton kicking to the western goal. Baker kicked off but the ball was quickly taken back to the half back line. Baker, Bloomfield (Capt), Berry, Batters, Bragge, Beveridge, Crapp, Cook, Drew, Freeth, Glasscock, Johnston, Leydin, McCracken, McInerney, Newton, Strickland, Woods, Wilson, Whelan, Martin McDonnell, McDowall. Carlton played Williamstown at Gardens Reserve, Williamstown. The Blues kicked against the wind in the first quarter to the beach end goal. Unhappy Williamstown barrackers unleashed a barrage of stones at Umpire Wilson after the game. Baker, Bloomfield, Berry, Batters, Beveridge, Bragge, Crapp, Cook, Considine, Freeth, Glasscock, Johnston, Leydin, McCracken, McInerney, Newton, Strickland, Woods, Wilson, Whelan, Martin McDonnell, McDowall. Best; Bragge, Leydin, Glasscock, Strickland. Players mentioned; (13) Bloomfield, Cook, Wilson, Whelan, Baker, Batters, Berry, Freeth, Newton, Glasscock, Leydin, Strickland, Bragge. Carlton Second Twenty played Williamstown Second Twenty at Princes Oval. VFA meeting at Boyle and Scott's Hotel. "It is astonishing the amount of betting that now goes on in football circles, compared with three or four years back, and I cannot help thinking it is introducing a class who patronise the game more for what they can make out of it than from any love for the grand old sport, as it is not an unusual occurrence now to hear men who have lost a pound or so insinuate that players have been "squared." Carlton played Sandhurst (Bendigo) at Sandhurst. Described as an interesting match, it took place at the Back Creek Cricket Ground. Baker, Bloomfield, Batters, Berry, Beveridge, Bragge, Crapp, Cook, Coffey, Considine, Deely, Freeth, Glasscock, Gellatly, Johnston, Leydin, Letcher, McInerney, McCracken, McDonald, Newton, Watson, Wilson, Whelan. Goals; Baker 2, Leydin 2, Bragge, Bloomfield, Gellatly. Best; Baker, Berry, Bllomfield, Beveridge, Batters, Leydin. Carlton Reserves played North Park at Princes Oval. Best; R. Calder, Merriman, Slattery, Alex Mair, Bonner. Carlton played St.Kilda at the St.Kilda Cricket Ground. The Carlton Football Club donated all proceeds to the St.Kilda Club for it's fencing improvements. Carlton was greeted with cheering from the Saints players for the club's generosity. The St.Kilda Football and Cricket Clubs have erected a 7 foot high picket fence around the ground. This action has caused many people to write letters complaining to the newspapers about the alienation of the Albert Park lands from the public. A crowd of about 1,000 attended. Bloomfield lost the toss, but in a one sided match the Blues won easily. Baker, Bloomfield (Capt. ), Beveridge, Berry, Batters, Crapp, Cook, Glasscock, Gellatly, Johnston, Leydin, Letcher, McDowall, McCracken, McInerney, Newton, Sharp, Strickland, Watson, Woods, Wilson, Whelan. Goals; Bloomfield 3, Letcher 2, Leydin 2, Wilson, Berry. Players mentioned; (14) Baker, Bloomfield, Crapp, Cook, Leydin, Whelan, Batters, Gellatly, Letcher, Strickland, Wilson, Berry, Sharp, Watson. Carlton Seconds played Britannia on Victoria Park. At the V.F.A. meeting a motion by Theophilis S. Marshall it was decided that all matches in June and July should be played for 50 minutes in each half; and all matches occurring in May, August and September should be played 55 minutes in each half. The meeting discussed the inconvience of teams arriving late for matches. "That the bell be rung at 3 o'clock, and the game not started later than 10 minutes past the hour, any club not ready to play then be fined one guinea ($2.10), and any club not ready to play at a quarter past 3 to be fined five guineas ($10.50), the rule to come into operation on or after the 17th. inst. Carlton played Hotham at the M.C.G. The Blues won the toss, and kicked to the eastern goal, there was no wind advantage. The Blues scored 11 goals which was the highest number of goals in any match so far this season. C. Letcher made his debut for the Blues. "Jack Baker undoubtedly played the game of the fourty, and proved beyond a doubt that he is still the Baker of old." "Berry from the Ballarat Club, who joined the Carlton at the beginning of the season, proved himself a tower of strength on Saturday...."
S. Bloomfield played a splendid game and led his team in a skilfull manner, quite worthy of his reputation." "M. Whelan was second only to Baker and was always on the ball, and did splendid service for his side." Baker, Bloomfield (Capt. ), Batters, Berry, Beveridge, Bragge, Crapp, Cook, Glasscock, Gellatly, Johnston, Leydin, C. Letcher, McInerney, McCracken, Newton, Strickland, Sharp, Watson, Wilson, Woods, Whelan. Goals; Baker 2, Leydin 2, Wilson 2, Berry 2, Letcher, Sharp, Batters. Players mentioned; (15) Baker (BOG), S. Bloomfield, Cook, Gellatly, M. Whelan, C. Letcher, Berry, Wilson, Leydin, Sharp, Batters, Newton, Strickland, F. Johnston, McCracken. Adams, Beere, Burns, Burns, Carter, Cader, Deeley, Davie, Gregory, Hutchens, Jackson, Lemon, Love, Myers, Martin, Merriman, McLeod, McDowall, McDonald, McDonald, McLaine, O'Shannessy, Russell, Urquhart, Woodburn. "There has always been a terrible spirit of rivalry between the Carlton and Hotham Football Clubs. Not always a healthy one, albeit of late years the objectionable elements have been slowly but surely eradicated . The dark blues have generally asserted their supremacy over the Hothamites; but never without a stubborn resistance. However, on Saturday last, on the Melbourne Cricket Ground, the Carltonians carried all before them, and wound up a dashing afternoon's play by scoring 11 goals 20 behinds to Hotham's 4 goals 5 behinds." Carlton played Essendon at the M.C.G. The grandstand was packed with Carlton supporters. The Blues lost the toss, but were the favourites to win this match. North Melbourne Advertiser; "The game was fairly contested throughout, although Carlton generally had the best of the game, the big ground suiting them far better than Essendon, their handball tactics, which if not throwing, bordered very closely upon it, being eminently successful, Baker, Bloomfield and George Cook especially showing great proficiency in this latest development of football." The play was fast, but the concerted efforts of the Blues was too much for the lighter Dons. Baker, Bloomfield (Capt. ), Berry, Batters, Beveridge, Bragge, Crapp, Cook, Gellatly, Johnston, Leydin, Letcher, McInerney, McCracken, Newton, Strickland, Sharp, Wilson, Woods, Whelan. Goals; Leydin 2, Baker, Letcher, Sharp. Best; Baker (BOG), Bloomfield, Strickland, Letcher, Leydin. Players mentioned; (13) Johnston, Whelan, Baker, Batters, Wilson, Newton, Bloomfield, Berry, Letcher, Sharp. Cook, Leydin, Strickland. Carlton Reserves played Essendon at the East Melbourne C.G. Best; Deely, Charles H. Myers, Merriman, Wilson. At the VFA meeting, a South Melbourne resident offered a gold cup for the seniors to play for, valued at 50 guineas ($105). "The secretary stated that many offers of a similar kind had been made, but the association had always considered that the excitement of the game was quite sufficient attraction without any such inducement as that offered." Carlton played University at Princes Oval. The students were completely outclassed. They only had the ball into their half of the ground twice and scored a behind, and then a goal just before the final bell. The Blues seem to be regaining some of their early season form. Baker, Bloomfield, Berry, Batters, Beveridge, Bragge, Cook, Drew, Gellatly, Johnston, Leydin, Letcher, McInerney, McCracken, Newton, Sharp, Strickland, Wilson, Woods, Whelan. Goals; Wilson 2, Baker 2, Letcher 2, Bloomfield, Berry, Sharp. Best; Baker (BOG), Wilson, Letcher, Leydin, Bloomfield, Drew. Players mentioned; (8) Wilson, Baker, Letcher, Bloomfield, Berry, Sharp, Leydin, Drew. Carlton Reserves played University on the University Cricket Ground. Carlton played Prahran at Princes Oval. The Prahran F. C. gained senior status this year. This is the first meeting between these clubs. The crowd was overwhelmingly comprised of Carlton barrackers. "The game was fruitful in goals from the outset, and no fewer than 10 were kicked in the first half, seven of them in favour of Carlton"
Baker, Bloomfield, Berry, Batters, Beveridge, Crapp, Cook, Drew, Gellatly, Johnston, Leydin, Letcher, McCracken, McInerney, Newton, Sharp, Strickland, Wilson, Woods, Whelan. Goals; Whelan 3, Gellatly 2, Bloomfield 2, Leydin 2, J. Baker, Berry. Best; Baker, Bloomfield, Berry, Strickland, Whelan, Cook. Players mentioned; (12) Whelan, J. Baker, Gellatly, Bloomfield, Leydin, Berry, Strickland, Cook, McInerney, Beveridge, Batters, Drew. Carlton played Essendon at the East Melbourne C. G.
A large crowd attended, this was the major match of the afternoon. Weather fair, ground in excellent condition, the game was even up until three quarter time. Bloomfield lost the toss, and Carlton kicked against the wind. Carlton's well arranged system of handball and discipline was not up to their usual standard, due to the absence of Baker. Batters did not play. However, Bloomfield showed leadership and pulled the game from the fire. All goals were scored at the railway end. Baker, Bloomfield (Capt. ), Beveridge, Berry, Bragge, Crapp, Cook, Coffey, Gellatly, Johnston, Leydin, Letcher, McCracken, McInerney, Newton, Sharp, Strickland, Whelan, Wilson, Woods. Quarter time scores are a guestimate. Goals; Woods, Berry, Leydin, A. Wilson, Letcher, Gellatly. Players mentioned; Bloomfield, Cook, Whelan, McInerney, Woods, Berry, Leydin, A. Wilson, Gellatly, Letcher, Strickland, Melville, Bragge, Johnston. Carlton played Williamstown at Princes Oval. Strong north wind blowing across the ground. Williamstown kicked with aid of the wind, which eased in the final quarter and was replaced by heavy rain. The visitors scored two unanswered goals in the first to be 2.2 at quarter time. In the second term Williamstown failed to score, and in the third they managed one behind. Whelan kicked the Blues first goal, and Gellatly the second soon after half time. Baker kicked the third near three quarter time. Whelan's second came during a heavy rain storm in the final term. Baker, Bloomfield (Capt. ), Berry, Batters, Beveridge, Bragge, Crapp, Cook, Coffey, Deeley, Glasscock, Gellatly, Leydin, Letcher, McInerney, Newton, Sharp, Strickland, Woods, Wilson, Robertson, Whelan. Goals; Whelan 2, Gellatly, Baker. Players mentioned; (5) Whelan, Gellatly, Baker, Bloomfield, Berry. Carlton Reserves played Williamstown Reserves at the Garden Reserve, Williamstown. Adams, Allan, Burns, Buchanan, Cader, Carter, Deeley, Davie, Gregory, Hadley, Heatley, Jackson, Jefferies, Myers, McLeod, McDonald, McPhee, Power, Ready, Turner, Tozer, Woodburn. Carlton played South Melbourne at the South Melbourne C. G.
Ground slippery from recent rain, however, it was probably the best ground in the city due to the sandy soil. South unbeaten so far this season. The crowd was so large that mounted troopers had to try and hold the crowd back after the fences collapsed. South won the toss and kicked with the strong breeze. Jack Baker who captained the Blues kicked to the lake end goal. The Blues were put off by the conditions and missed some easy chances to goal, and South kicked away. The Blues fought back and were playing the better football when the bell went. Berry scored the Blues' first goal and this was followed by Sharp (according to Melbourne Punch), and Berry the third. Baker, Bloomfield, Berry, Batters, Beveridge, Bragge, Crapp, Cook, Coffey, Drew, Gellatly, Johnston, Leydin, Letcher, McCracken, McInerney, Newton, Rickards, Sharp, Strickland, Woods, Wilson, Whelan. Umpire; J. Shaw, formerly of Hotham. Goals; Berry 2, Whelan, (Sharp is credited with a goal in the Age and Herald) . Best; Crapp, Baker, Berry, Whelan, Letcher, and Leydin. "The last issue of the Melbourne Weekly Times gives some particulars of the Carlton Club which now has been established 22 years. Anyone of good football memory traversing the list of post-captains will, therefore, not wonder that "the old club" is to-day as prosperous as we have pleasure of finding it. Such sterling field athletes as B. James, H. Chadwick, D. Adamson, Theophilis S. Marshall, G. Kennedy, J. Conway, J. A. Donovan, H. Guy, J. Gardiner, G. Robertson, R. H. Frayne, W. Goer, and J. Baker, all of whom at various times commanded the "dark blue" forces, could scarcely fail to bring their team to the front; while the present skipper, T. Bloomfield, is not a whit less competent than his many able predecessors. At the present time the members' roll contains 450 names, so that there is a large field from which to select the playing representatives. Every week the team is revised by the committee. Such changes in the personnel of the first twenty as are considered necessary to the maintenance of the highest possible efficiency are unhesitatingly made. Concerning the present team, I think it may safely be said that the club seldom, if ever, placed a better all round company in the field. Every point of the game is well represented, some departments especially so. In the team there are at least eight who can, if required, fill any position with credit to themselves, and satisfaction to the club. There are quite half a dozen players who can be depended upon for long distance-kicks, verging on a fifty-yards average, namely, Baker, Bloomfield, Johnston, Leydin, Whelan, and Newton, while a larger number may be regarded as more or less trustworthy goal- kickers"
Carlton played Melbourne at the Friendly Societies' Ground. Carlton were the favourites having won previous match decisively. O'Bern playing for Melbourne, scored the first goal, ex Blue? Carlton was not familiar with the narrow confines of the ground. The Reds took it right up to the Blues from the start of the match scoring the first two goals. Baker, Bloomfield, Berry, Batters, Beveridge, Bragge, Crapp, Cook, Coffey, Drew, Gellatly, Johnston, Leydin, Letcher, McInerney, McIntosh, Newton, Rickards, Sharp, Strickland, Woods, Wilson, Whelan. Goals; Leydin, Gellatly, Berry, Whelan, unknown. Carlton Reserves played Melbourne at Princes Oval. Adams, Allan, Burns, Buchanan, Cader, Deeley, Davie, Dowall, Gregory, Hadley, Jackson, Jefferies, Lemon, Love, McLeod, McDonald, McPhee, Merriman, Reidy, Woodburn. "a special system of flag signalling has been adopted for this occasion, a red flag indicating a goal for South Melbourne, and a blue flag for the same result for Geelong, while a white flag in either case will be hoisted for behinds." Carlton played Hotham on the Hotham Recreation Reserve. Gates to open at 2pm, match to commence at 3pm. Carlton members admitted to ground only on production of their members ticket. Pavilion; Gentlemen 1/6 (15c), Ladies 1s (10c). Both teams were missing players and substitutes had to be used. Carlton won the toss and kicked with aid of the breeze. Baker, Bloomfield, Berry, Batters, Beveridge, Bragge, Crapp, Cook, Coffey, Drew, Davey, Gellatly, Gregory, Johnston, Leydin, Letcher, McInerney, McIntosh, Newton, Rickards, Sharp, Strickland, Woods, Wilson, Whelan. Players mentioned; (8) Leydin, Gellatly, McInerney, Johnston, Whelan, Sharp, Woods, Bloomfield. Carlton played Geelong at the Corio Cricket Reserve, Geelong. The S. S. Excelsior departed Queen's Wharf at 10am carrying Blues fans to Geelong. Leaving Geelong on return at 6pm for 3s (30c) round trip. In calm conditions, the Blues lost the toss and kicked to the northern end. The Blues had a brief rally in the second quarter when through excellent play they put on two quick goals, but this only spurred the Pivots into action and they ran away with the game. Baker, Berry, Batters, Bloomfield (Capt. ), Beveridge, Bragge, Crapp, Cook, Coffey, Drew, Frew, Gellatly, Johnston, Leydin, McInerney, McCracken, McPhee, Newton, Rickards, Sharp, Woods, Wilson, Whelan. Three quarter time scores are a guestimate. Players mentioned; (10) Baker, Whelan, Cook, Beveridge, Leydin, Newton, Bloomfield, Berry, Woods, McInerney. Carlton played Richmond at Princes Oval. Richmond won the toss and the game commenced at 3.15pm. Rickards began the game by kicking off for the Blues. Baker, Bloomfield, Batters, Beveridge, Bragge, Crapp, Cook, Coffey, Frew, Gellatly, Johnston, Leyden, Lemmon, McInerney, McCracken, McPhee, McIntosh, Newton, Rickards, Sharp, Whelan, Wilson, Woods. Players mentioned; (7) Rickards, Leydin, Gellatly, Baker, Whelan, Bloomfield, Johnston. Carlton Second Twenty played Carlton Standard at Royal Park. Carlton played Fitzroy at Princes Oval. Fitzroy tried to have the match moved to Brunswick Street where a charge could be made for admittance. The Blues preferred to play at Princes Oval. Ever since the formation of the club, Fitzroy have been Carlton's bogey team and a real thorn in it's side. At half time, 12 "Derrimut" balloons made an ascent with free distribution. The 'Roys won the toss and kicked with the aid of the wind which was blowing from the south west and confined a lot of the play to the northern wing. The Blues broke the game open with three quick goals after half time. Baker, Bloomfield (Capt. ), Berry, Batters, Beveridge, Bragge, Crapp, Cook, Frew, Gellatly, Johnston, Leydin, Lemon, McCracken, McInerney, McIntosh, Newton, Rickards, Sharp, Strickland, Wilson, Woods, Whelan. Goals; Leydin, Rickards, Whelan, Baker, Berry. Best; Cook, Leydin, Batters, Baker, Gellatly, Newton. Players mentioned; (10) Bloomfield, Leydin, Rickards, Whelan, Baker, Berry, Cook, Batters, Gellatly, Newton. "The annual ball given by the Carlton Football Club at the close of the football season took place last evening, in the Athenaeum, and proved, as usual, very enjoyable. It was attended by about 150 couples. Dancing was commenced at 9 o'clock, and continued until early hour this morning, to music provided by the Bavarian band. An excellent supper was prepared by Messrs. Edlinger and Goetz. The president Mr. Gillespie, after the supper, made a presentation of a handsome gold watch and chain to John Baker, whose name is familiar to all lovers of the game. "Presented to John Baker by the members of the Carlton Football Club, as a slight token of their respect and esteem; also, as a mark of appreciation for his merits as a sterling player." The Australasian in a report on the St. Kilda Cricket Ground says that in addition to both the Carlton and South Melbourne Football Clubs donating their share of gate takings to the club, the Carlton Football Club also donated a large flag pole which is erected near the pavilion. The report says the area of the ground is larger than the M.C.G. "A deputation of the Carlton cricket and football clubs, accompanied by Mr. Jack Gardiner, Mr. J. Laurens, and Dr. Rose, M.L.A.s, waited upon the Minister of Lands yesterday as to ask for about ten acres in Princes Park as a football and cricket ground, off Cemetery road west, near Sydney-road. At present the cricket club has triangular piece of ground, about five acres in area, between the University and Prince's-park, and the football club has about five acres in the unplanted portion of the park, beyond the Cemetery, both of which they were prepared to give up if their request was granted. Mr. Dow said he should be glad to give them every encouragement, but the land they asked for was in the jurisdiction of the Parks and Gardens Committee of the Melbourne City Council, and he must wait for the result of the inspection which the committee intended to make on Thursday next, before giving a definite answer." Carlton's Jack Baker was once again placed amongst the top players of the Association. He is mentioned after Essendon's C. Pearson who left the colony in July. Other good players were Batters and Cook. "....returning to Carlton, this team started the season under the most favourable auspices, and was considered to be the most likely one to break down the monopoly attached to the premiership, but after several victories, in which the team showed splendid form, intoducing the most effective and pretty style of "handball," it suffered defeat at the hands of it's bete noir, Fitzroy, after which the form was only at time apparent, and a little more perseverance might have changed some of the subesquent defeats into victories. The old club occupies a more prominent position on the list than it has done for some seasons past, and can certainly lay claim to having about the most brilliant player afield in Baker. The principal players have been Baker, Berry, Bloomfield, Bragge, Batters, Crapp, Cook, Drew, Gellatly, Letcher, Leydin, McInerney, Sharp, Strickland, Whelan, Wilson and Woods. Leydin 22, Baker 18, Wilson and Berry 17 each, are the chief goal kickers." Intercolonial Football Conference held at Young and Jackson's. In the second rule "ten yards" was substituted for "20" in defining the distance of the kick-off posts from the goal posts. The fourth rule was altered as to require the field umpire to bounce the ball after the sides changed ends, instead of throwing it up in the air. A change in the eighth rule, in that the goal umpires shall be the sole judges of goals, and that their decisions will be final, and that goals will indicated by flags. The ninth rule was amended so as to make it compulsory that the goal line shall be indicated by a white line. New rule twelve abolished the phrase "free kick" and the words "kick" or "mark" to be used instead. The distance a mark shall be given was reduced from five yards to two yards. "In rule fifteen the last clause, referring to boundary umpires, was eliminated." No player either senior or junior shall play with more than one club, unless he changes address from town to country or vice versa, or from colony to colony. "Any club playing a man who receives money either directly or indirectly for his services as a footballer shall be fined £10 ($20) for the first offence, shall lose the match, and be disqualified for any period the association sees fit. That any player receiving payment, either directly or indirectly, for his services as a footballer, shall be disqualified for such time as the local association sees fit." Pushing from behind will not be allowed under any circmstances. No player may interfere with a player after having secured a mark. Any player offending either of these rules will be reported. Arranged matches cannot be cancelled without written consent from both club secretaries, and a majority of the permit committee or the local association. All matches must be played 50 minutes each way in June and July, and 60 minutes in May, August, and September. Any club playing more than the stipulated number of men will be liable to a fine of £10. A petition was presented by Councillor Ievers, "from between 3,000-4,000 residents of Carlton, praying the Council to exchange a site in Princes-park for the Carlton football ground." Nothing much has changed in the 125 years since this was written. "Crowds only go to the Melbourne Cricket Ground to see football matches, naval and military sports, bicycle meetings, and so on; but cricket there is seldom witnessed by more than three or four thousand people, excepting on such holidays as Tuesday last or Boxing Day." The article goes on about ways to revive the flagging fortunes of cricket such as widening the wickets and/or narrowing the bat, relaxation of the bowling laws etc. Hotham footballer, and briefly Carlton player Joseph 'Joey' Tankard who had the famous altercation with George Coulthard in 1882, was on a charge of having alledgedly criminally assaulted a woman. On seeing the police, the woman aged 40, cried out that she had been outraged by the men. Joseph Tankard was one of five men arrested for the incident at Royal Park at 1am Friday morning. The police medical officer who examined the woman, "does not speak positively as to the offence having been committed." Cr. Carter strongly objected to the proposal to grant the Carlton football and cricket clubs a parcel of 10 acres land in Princes-park in exchange for the other two areas the clubs occupy. He, and other council members wanted to stop encroachments onto public land. The Carlton Story. Hugh Buggy and Harry Bell. Pages. 58, 59, 259. Mullin's Footballers Australian Almanac of 1951. Page. 66. History of the Carlton Football Club. B. Hansen. Pages. 63, 64, 65. North Melbourne Advertiser, 1886 editions. Evening News Sydney, 1886 editions. Riverina Herald, Echuca 1886 editions. Contributors to this page: blueycarlton , pblue , molsey , nikki and admin . Page last modified on Friday 12 of April, 2019 16:31:52 AEST by blueycarlton. 1997 Rd 14 - Ratten & Williams eye off the footy. 2013 Rookie Draft; Cameron Wood.